Our last two updates (Post-Ex Diary 8: Specialist Analyses Part One and Post-Ex Diary 9: Specialist Analyses Part Two) described the value of post-excavation investigations and began to detail the variety of techniques being carried out on different artefacts, materials and environmental samples. In this final part we finish this overview and also discuss the importance of scientific dating and conservation work. Studying worked timbers can give us information on the different stages of the settlement’s lifespan, such as examining the cut marks on these palisade timbers created during its construction. Perhaps the most striking thing about the Must Farm site during the excavation was the sheer quantity of preserved wood present. These ranged from the neatly arranged palisade posts and structural uprights to hundreds of immaculate woodchips that looked as though they had only just been cut from timbers. In total we recorded just under 6,000 pieces of wood, some only a few centimetres in diameter, others so enormous they required four people to lift them. Much of the post-excavation looking into the wooden material is focused on understanding the different components of the settlement itself: its construction, architecture, occupation and destruction in the fire. With such a large quantity of wood with a huge amount of information associated with it, this task is far from straightforward or easy. 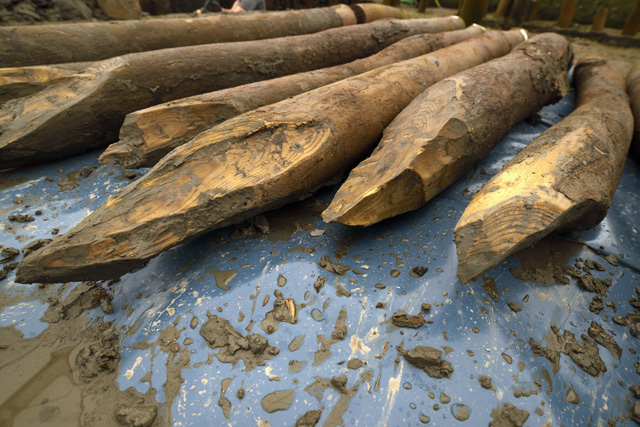 Studying the wooden assemblage ties into other forms of analysis, such as comparing the bronze axes with the stop marks created when shaping the points of palisade and building stakes. There is an enormous range in the wooden objects and post-excavation study has identified fragments from boats, handles and many other fascinating glimpses into elements of the settlement. Many of the timbers feature distinct patterns of charring and studying these is of critical importance to the fire investigation by determining their original positions within the structures. The scale of this area of research means that work on the waterlogged and charred wood is ongoing and it is essential to gaining a good understanding of the settlement from its beginning to its end. 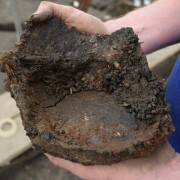 We’ve discussed our recent post-excavation work on Must Farm’s ceramic assemblage (see Post-Ex Diary 6: Refitting Must Farm and Post-Ex Diary 7: The Must Farm Pottery Refit). This analysis is continuing and is currently focused on a more detailed examination of the various vessel types, their breakage histories and spatial patterning at the settlement. 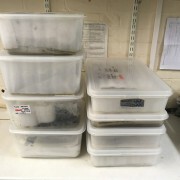 These studies have been assisted by the refitting exercise we carried out which helped provide a more complete understanding of the quantities of individual vessels and how sherds were distributed at the site. 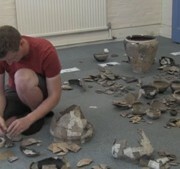 Must Farm has one of the largest collections of Late Bronze Age textiles. We’re putting the finishing touches on a series of updates going into more detail about these amazing finds. Must Farm’s assemblage of fibres and fabrics and the materials associated with the production of textiles was one of the site’s most exceptional categories of artefact. Specialists have been hard at work studying the collection of finds since the excavation finished and the textiles are currently carefully being conserved. As the fibres and fabrics are one of our most exciting artefacts we have recently been speaking to our specialists and preparing a series of videos going into more depth about the different characteristics of the textiles. These updates are currently being finished and will be posted in the coming months to provide an overview of the Must Farm assemblage. 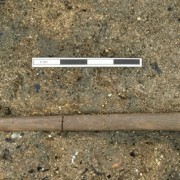 Only a small selection of worked bone and antler items were found during the excavation with most showing signs of calcification, demonstrating that they were burnt in the fire. 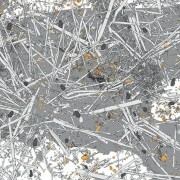 While they represent a fraction of the overall assemblage it is still essential to understand how they were being used. 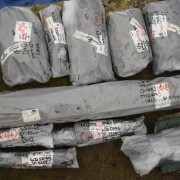 Most examples seem to have been handles for metal artefacts and examinations are currently ongoing. The positioning of beads at the site seems to indicate that some would have formed composite necklaces of amber, glass, stone and jet. 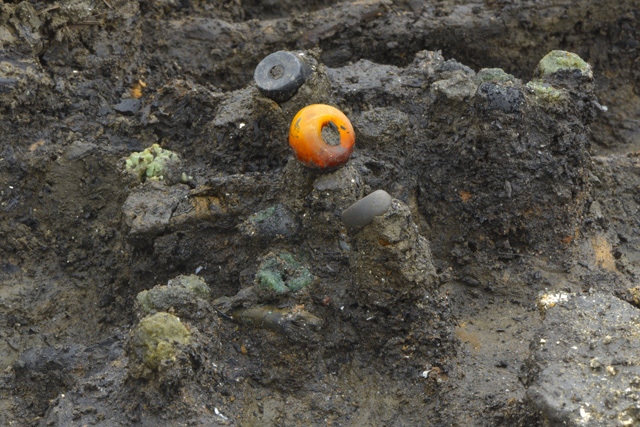 A variety of beads were found during the excavation of the Must Farm settlement with many made from glass. The condition of the glass beads varied with some having been shattered or damaged by the heat from the fire and others affected by the water conditions of the river they ultimately were deposited into. Specialist analysis of these artefacts is focusing on their chemical composition to try and determine where they were made, with the source potentially as far away as the Middle East. Studying the glass can also give us insight into their potential dates and enhance our understanding of Late Bronze Age trade routes. Alongside the glass examples, beads made from other materials were also recovered including amber, jet, stone and even one made potentially from tin. The positioning of the beads suggest that they formed composite necklaces mixing glass and non-glass examples together. 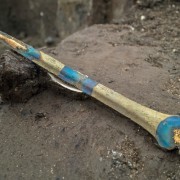 Specialist work is still being carried out on the beads which are fascinating artefacts as they are one of the few overtly decorative objects recovered from the settlement. While many tools in the Bronze Age were unsurprisingly made from bronze, worked stone and flint artefacts continued to be made and used. 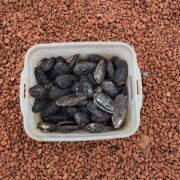 A small quantity of worked flint was found at the settlement with much belonging to the crude style typically associated with Late Bronze Age assemblages. Alongside this, a selection of worked stone was found including examples that appear to have been used for blade sharpening and as anvils. These are currently being studied alongside burnt stone fragments that show signs of being repeatedly heated, potentially from use in cooking at the site. 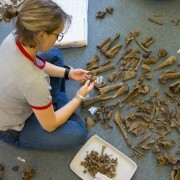 Only a small quantity of disarticulated human remain bone was found during the Must Farm excavation with many of the fragments found in the river channel. A skull was recovered that may have been kept in one of Must Farm’s structures and will be examined to explore this possibility. The recovered bone will have stable isotope analysis carried out where possible to try and determine the diets of the individual(s) they belong to. The human bone will also be dated to see how these remains relate to the site as none seem directly tied to the destruction of the settlement. 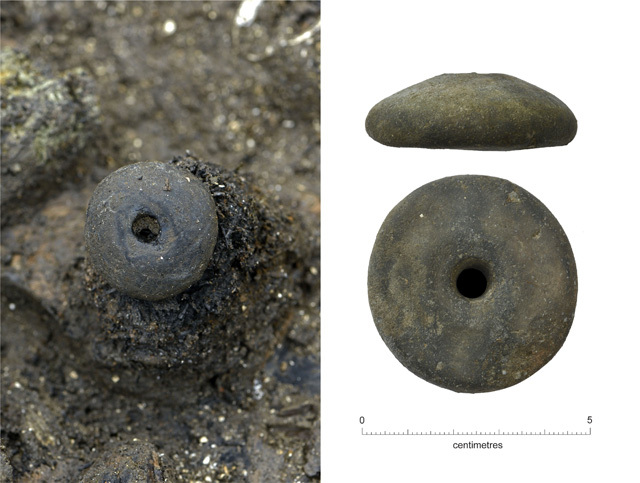 Some of the spindle whorls from the site were so finely made we at first thought they were stone but on closer inspection they were made from worked clay. Specialist studies of burnt and worked clay is largely centred around the spindle whorls and loom weights. A small number of these artefacts were found at the site and some were so well crafted that we initially thought they had been made from stone rather than clay. Specialists are currently examining both spindle whorls and loom weights to explore typologies that will help with dating and inform the studies of the fibres and fabrics. One of the most exciting aspects of the Must Farm settlement is our chance to understand the lifespan of the settlement. How long had the structures and the palisade existed before the fire destroyed the site? The evidence is currently suggesting a short occupation, perhaps less than a year, which means that dating techniques will play an important role in our interpretation of the archaeology and narrative of the settlement. Although, it appears that our settlement was so short-lived that its duration falls outside of the current capabilities of radiocarbon dating – we will have to look to other means to understand how long the settlement lasted! Specialists are using a combination of radiocarbon dating and dendrochronology (tree ring dating) to add a precise timeframe to the Must Farm site. With so much wood present at the site it was necessary to carefully select the best candidates for dendrochronology, ensuring there were enough ring sequences to get reliable results. 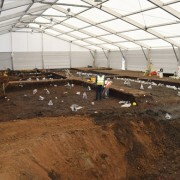 Work into both techniques is ongoing and establishing an accurate chronology for the site, from construction to destruction, is extremely important for the interpretation of the site. The 2015-16 excavation at Must Farm produced thousands of different artefacts made from a host of varied materials, from plant-fibres to bronzes. Ensuring that these 3,000-year-old objects survive for the future is critical. Conservation requires careful specialist work to stabilise artefacts that have lain in largely unchanging conditions for millennia. With much of the Must Farm assemblage very delicate, particularly the large collection of Late Bronze Age textiles and organic objects, this is a time-consuming methodical process that is very much ongoing. 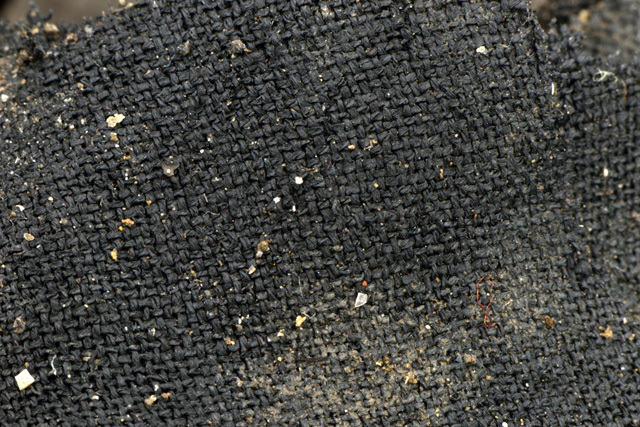 Objects like waterlogged timber must replace the water that prevents decay with other substances, such as resins, which will allow these artefacts to be displayed. With much of the material still being studied and conserved, displays of the finds are still some way off but we are moving ever closer to future exhibitions. Specialist work is a vital component of all post-excavation that helps to develop and refine on-site interpretations by providing evidence of more subtle details and aspects of a site and its history. These forms of scientific analysis and investigative techniques are rarely shown in depictions of archaeology but are a critical means of building a more complete interpretation of past activity, artefact usage and environmental conditions among many others. Must Farm’s specialists are all working hard on their materials and samples and it is only with their combined knowledge that we can hope to develop and refine our understanding of the site’s past, construction, architecture, occupation, destruction and post-depositional life.